Advanced Seeds - Sweet Dwarf Auto. Free US delivery. 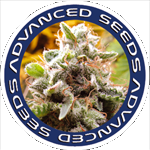 Auto Sweet Dwarf feminized by Advanced Seeds grows to a compact plant with a short flowering time, making it ideal for both indoor, outdoor and guerilla growing. In both environments it'll reach a height of 50-100cm. The short flowering period of only about 60 days make it suitable for colder climates; outdoors, the best time for harvesting is between April and November, wherein it can be grown indoors throughout the whole year. Auto Sweet Dwarf feminized by Advanced Seeds has an intensely sweet and candy-like aroma and can yield an average harvest of 300-400g/m². The Auto Sweet Dwarf buds have a THC level of 15%+ and bear a beard of white hairs. Chatty, friendly and amiable - a great accompaniment to social events.